It is a cold, mid-November evening. Twenty-two people stand squeezed into lifejackets and brightly-coloured waterproofs; 11 kayaks float silently, waiting for us like a pod of whales upon the glassy surface of Limehouse Basin. The cloudy night sky shows no stars, but the rain, at least, stopped sometime earlier. Excitement fills the air – whatever the weather, I don’t think any of us would have missed what we were about to do. So began the night kayak I had been looking forward to for so long. Organised by Secret Adventures, the city’s freshest escape opportunity, the idea has excited so many that it’s led to many a meet-up of urban individuals seeking to experience London’s ‘wilder’ side. Founded by Madoc Threipland in 2014, Secret Adventures co-ordinates a mix of thrilling evening and night-time experiences all year round. It’s successfully tapped into that unfulfilled desire for communal activity which lies within many of us – and which can become quashed after living in London. 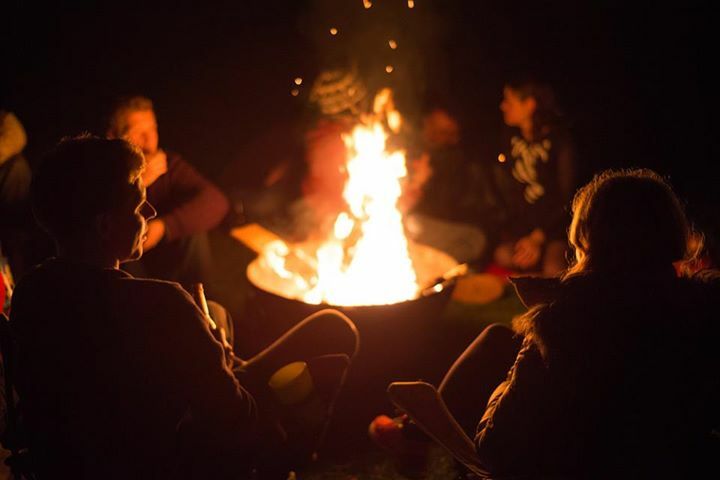 From midnight moonlit swims all year round, wilderness weekends in Wiltshire, kayaking below Tower Bridge under the sunset, and campfire sing-alongs while toasting marshmallows, Secret Adventures is, unsurprisingly, growing rapidly – and has developed a loyal following. 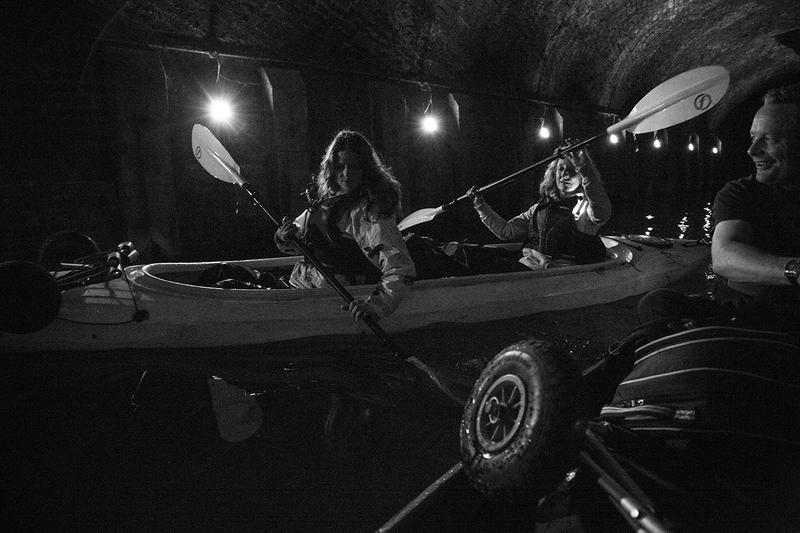 The night adventure I was lucky enough to go on involved paddling in double kayaks from Limehouse Basin to Crate Brewery near Stratford, a total of about six kilometres. Slicing my paddle back and forth through the black waters of London’s canals, I felt a sense of tranquillity and childlike glee that can be difficult to access in London. Watching the lights of Canary Wharf wink through the darkness, gliding alongside bemused ducks and catching glimpses of barge-dwellers’ lives through small yellow squares of light, I was reminded of how different London is from the water – and how beautiful. We reached our destination a few hours later. Cold and slightly damp from splashing ourselves with our amateur paddling, we dropped off our kayaks and boarded a warm barge, reserved especially for us. We ordered pizza and warmed ourselves drinking hot apple whisky. It was the perfect end to the evening. What made you decide to start up Secret Adventures? I used to work on international expeditions and when I came back from Africa I was still in adventure mode and went looking for adventure here in London. Running international expeditions and youth projects. We also organise and fund mini adventures to get kids out of London. Is there something you think Londoners in particular lack in their lives – hence the need to escape and do fun things, like with Secret Adventures? Londoners often lack a sense of adventure and exploration. So last nights kayak in the dark for example is a bit special just being in darkness. Also Londoners can be quite closed so it’s a great way to bring people together in a shared adventure. The secret concert was pretty special. A flame lit concert under a building only accessible by boat. Also we wild swim under a full moon every full moon in London. That’s fun too! What’s next? Plans for expansion? Always looking for new exciting ideas. We just want to organise special exciting events that leave people a giddy child like sense of adventure. There’s some more info about Secret Adventures here and in the blog also.